Umm, wrong. The only reason you have the idea is because we came up with it. You didn’t walk through the doors of a public library, you came into a place of business—a place where employees come to work and earn the money that will buy their groceries and pay their rent. I get a little annoyed when people gripe about Stitch Fix and its associated costs. The model is that they do the shopping for you, not that they scour the stores for the best deal for you. They can resell what they offer at a higher price than they pay for it. That’s what grocery stores and restaurants do, it’s what stores at the mall and online do. It isn’t criminal, it’s business. You pay $20 for the chance that maybe they find something that you wouldn’t have tried on or would not have been able to find on your own. If they do a good job, that $20 comes right off the price of the clothes, if they miss the mark, it might cover their time, though I imagine that they spend more than an hour curating the outfits. I don’t really want to get into debate over living wages, but if you think their time isn’t worth $20, than you never should have signed up for the program. I’ve seen the video of a clothing item from a fix with a lower price tag than it was listed for—yes, that was clumsy, yes you can be annoyed, but it doesn’t mean that Stitch Fix isn’t a viable option for other people. My latest fix came today, I think it’s about the 7th one I have received. When I opened it and saw two pairs of pants I was annoyed because in my feedback I have made it clear that some of the styles they send are not great for me. This time it was different. The pants were the right style, the right length, and they were within the price range I said that I would pay. The first pair is a mid-rise skinny in bordeaux. I couldn’t believe that they were long enough. They don’t do that thing that tight pants do on women with calves like mine, you know that thing where they go taut over the backs of your knees and don’t even touch your skin? I did a deep knee bend and they didn’t show my underwear or make me grunt. I smiled at my deep teal painted toes from my date with Heather Barmore the other day. I know that high-waisted pants are coming in, but they are not going on me. These mid-rise were high enough that they don’t require tiny hip hugger underwear and not so high that they flirted with my belly button. The second pair is some magical color between navy and black. Long enough and even cuffable! The thing with these stretchy kind of pants, they can make you look flat in back. 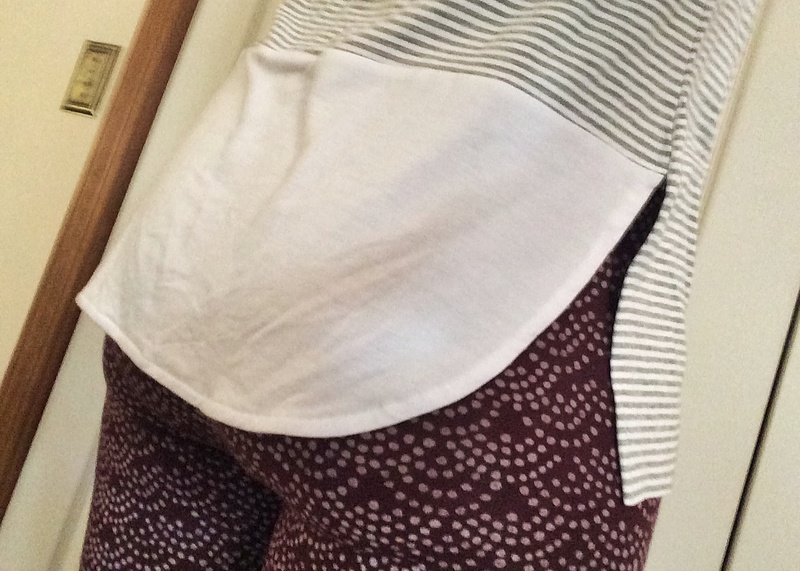 As I awkwardly tried to look at my backside and photograph it I was pleasantly surprised by the fit. Let me talk about the tops, because I have agreed with some of the naysayers about the flowy and boxy styles they’d been sending. Not this time. The first shirt actually made me moan. I love a long sleeve shirt, but the broadness of my shoulders and the length of my arms usually makes for very ill fitting stuff. I am in love with this shirt. The quilted look on the shoulders has stretch and easily managed to extend from one side of me to the other without pulling in other areas. 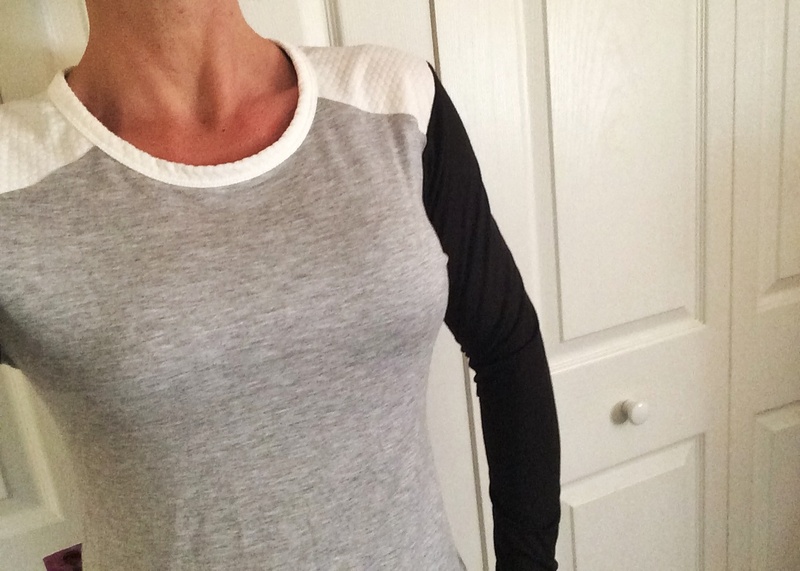 The black sleeves are stretchy and soft, same goes for the grey torso area. It’s like it was made for me. The other shirt, which has an odd line in the earlier shot because I am neither a fashion blogger nor a planner, was a creeper. I wasn’t sure at first if I’d even try it on, but then when I did I loved the tail in back and the slits on the sides—not too high, not too low. The cap sleeves, which can be a problem with my arms and shoulders, were so soft. Usually I experience armpit torture, not to mention unsightly bra lines on my back. Not with this! After trying everything on I looked at the stuff within the context of clothes that I already have. Will they mix and match with things that I already own? Are they colors that I will get sick of before spring? Do I believe that the prices are fair? Will I wear the necklace? The answer was that they all work. Both pairs of pants will play nicely with the boots I have and several of the sweaters that I own. The tops are perfect immediately as we have cold mornings and muggy days. When it gets even colder, they grey tee may need to go into hibernation, or I could layer it for weekends by the wood stove. As I look at the box and imagine what it would have taken for me to get to the mall that is 45 minutes away—a sitter, or a free weekend day, the right mood…it goes on and on. Trying things on at home is so much less demoralizing than standing in the dressing rooms at some of these shops. I have my favorite store locally, which I still go to for jeans and tops, but the benefit of Stitch Fix is that it comes each month without fail. I can keep things or not, but it is my guarantee that once a month for at least a half an hour, I focus on me. It won’t always be perfect, but it will always be worth $20 for that chance that it might be. If you want to try it, here’s a referral. If you sign up and order a fix I will receive a credit, then you can go on to do the same thing on Twitter or Facebook or just through an email to a friend. You don’t have to do any of this. What I do hope that anyone who is reading this will do is consider the value of other people’s time; from the contractors who come to your home to give you a quote, to the accountants you work with to file your taxes, to the nurses who call you hon as they draw blood. We’re all working and we’re all trying. And, maybe if we’re lucky, we’re looking fabulous as we go about our day. 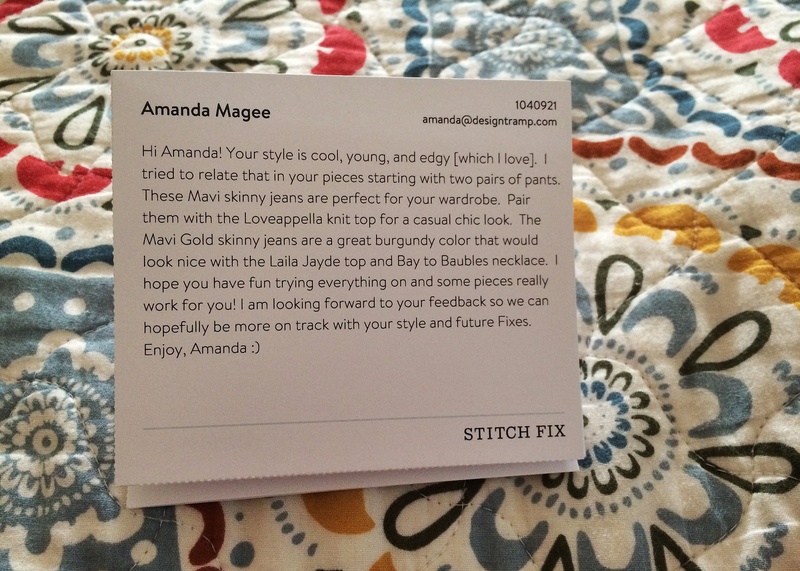 I’ve gotten 2 stitch fix and totally agree with you! I have liked at least some of what I got both times which has made it worth it for me! I am so glad! I’ve also been so surprised by how comfortable the items are—even pieces I didn’t select, I could’ve kept just for their coziness. What I love the most about this post, Amanda, other than you looking incredibly stylish of course (I love those tops! ), is your reminder that people who work in the service industry deserve to be compensated honestly for their time. As I lawyer, I am constantly asked to provide pro bono opinions and when I finally realized I cannot do that anymore (I need to cover overhead, etc. ), except once in a while, and decided to start asking at least a modest fee on some of the smaller cases (I help people find out whether they can lawfully have backyard chickens, construct greenhouses, etc. for urban agriculture), I got a surprising amount of flak. After I told one potential client that I would have to charge her a nominal amount to research the issue in her town, she harped that she didn’t want to pay me to do that when she could just go to city hall and ask herself. I was taken aback. She wasn’t paying me to walk in to city hall to ask one question, my services would have been to research the issue fully and give her an informed opinion based on her zoning district, etc. Much different, and, not surprisingly, the kind of thing I have to do or else I could lose my license if I make a mistake that leads her astray. Anyway, sorry to ramble. But I just so wholeheartedly agree that when someone is giving you their ideas, time, and/or expertise, in ANY field, they deserve to be compensated accordingly. Now, let me know when we can see you on the catwalk! I am so sorry that you get that kind of attitude. I don’t understand when it was that people stopped valuing other people’s time. It’s tragic and rampant. I agree!! 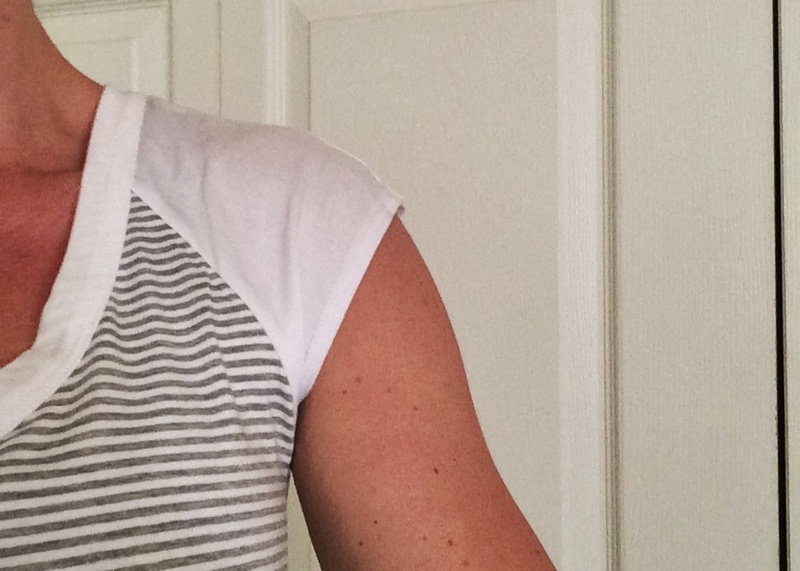 I have tried Stitch Fix and found that the items I received clearly had followed what I stated in my profile. If I didn’t like them, it just seemed to boil down to a little preference thing. That is impossible to 100% get accurate, 100% of the time. I live in a fairly small town with minimal options for fashion. The service Stitch Fix offers is a fun one. I don’t do monthly but splurge when I can. It’s also gotten me to play around on Pinterest a little more, which really helps me get out of certain ruts. Today I tried a skirt with little ankle booties and loved it. Never would’ve done it without puttering around on Pinterest a bit. 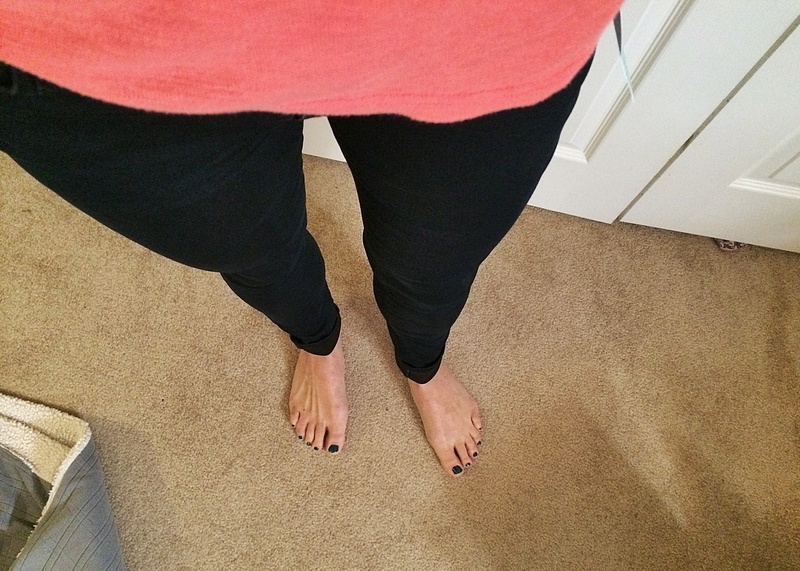 Never tried stitch fix… Got to say,nin envious of your flat bum. ? 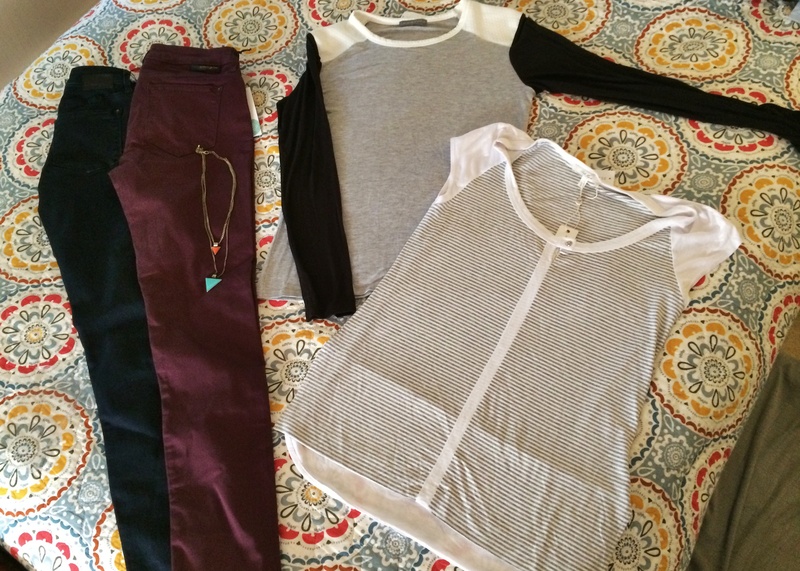 I love Stitch Fix and agree that it is worth every penny. I had a bunch of bad fixes and thought about ditching it and then realized that perhaps I should update my style profile. I did and voila- nothing but success since then! I kept a jean jacket that was a bit outside my zone because it was so inexpensive. My daughters are already borrowing it! You look gorgeous! I haven’t tried Stitch Fix yet but need to take a look. Let me know if you end up trying it and how it works for you! And thank you. I’m trying to be less of an oaf about accepting compliments. I am so glad someone spoke up on this. Writers and bloggers especially should be sensitive to the issue of deserving compensation for work. The prices are reasonable. Nobody wants to pay for ANYTHING anymore. It’s a real entitlement attitude and it bugs me a lot. For example, I’ve had friends ask if they can borrow books where I have an essay. Really? I’m clearly hoping people will buy the book and you’re asking ME to borrow a $10 book!? Okay moving on . . . I have not tried Stitch Fix, but I’m open to it after seeing this box. I LOVE all four items!! LOVE! And they look great on you. The bordeaux pants are my fav. I want a pair like that or a red pair. And love the shoulders on the long sleeve. Fabulous. Nina, that’s exactly it. I am so glad to know that there are others bothered by this. Another one that gets me is the people who talk a big buy local talk and then do all their shopping at WalMart and Amazon. 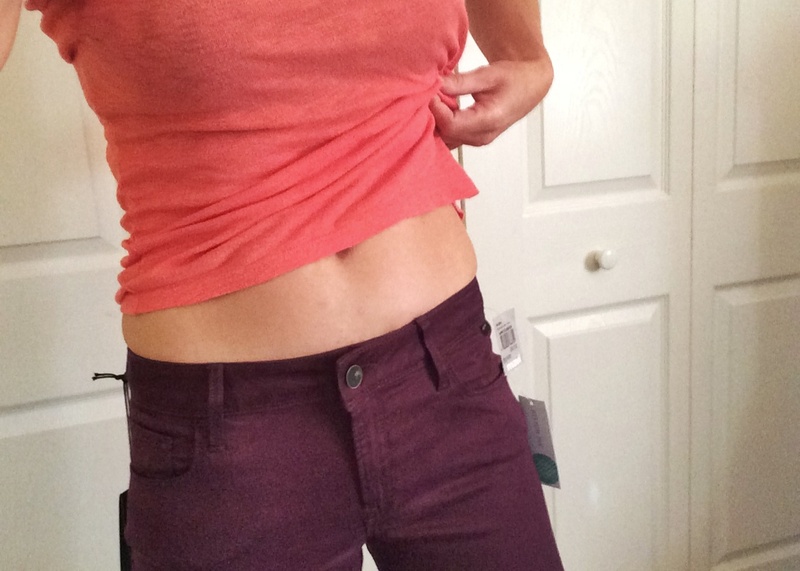 I am not usually a fan of colored pants/ jeans, but the bordeaux one just looks divine on you! I ove the cap sleeved tee, totally my style. The pants are unbelievably comfortable too. Never would’ve imagined. Where did you get that bedspread? I love it. Also, what is the brand name for the shirt with the quilted shoulders. I pinned that top, hopefully I’ll get it in my next box. Thanks. I thought it was Company Store, but I just looked at the tag and it was Target. As for the shirt, which I am wearing today so happily, is Loveappella. I just realized it has little thumb slits on the sleeves. Love it even more. 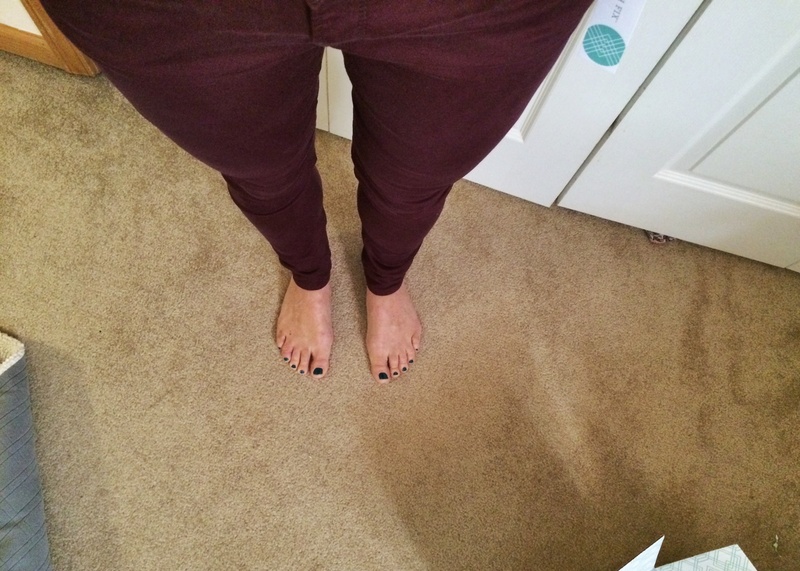 That burgundy shade for the mid rise skinny looks amazing for fall! I’ve never tried Stitchfix but this post is convincing me to 🙂 Have you heard of/ tried Vain Pursuits? I saw a video on them from YouTube and it seems like a similar convenient service to Stitchfix but for personalized skincare. Seems like a good way for some pampering but not sure if it’s good. The color has been super versatile! I haven’t heard of Vain Pursuits. I have a subscription to Birch Box. It has been fun, the girls are wild about the boxes arriving. Briar is in to perfume now, so she takes those samples. I’d love to get a better handle on skin care, but it seems hard to believe ti could be done through mail…will you let me know if you try it and it works out? Wore’em again yesterday. Ridiculously comfortable.